Get rid of the junk drawer. Wheels Mfg. and Lexco offers small parts integral for repair work that is efficiently packaged and presented, easy to get to and extremely well organized. So now there's no need to waste time looking for a small part to complete a repair job. Loose ball bearings - 25 and 300 grades - packaged in tub and bottle containers by size. 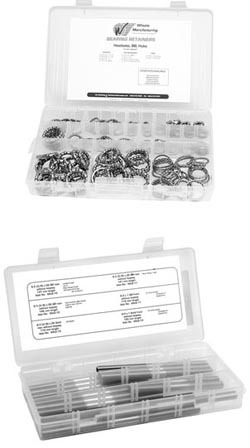 Plus, ball bearing retainer kits. Ceramic sealed bearings that are 70% stiffer, 75% smoother and 60% lighter than steel bearings. Again, completely organized as to diameter and width. Axle spacers precision machined from 0.5mm to 5mm thick and organized by thickness in segregated plastic containers - 120 spacers in total. Chainring spacer kits that come in both small and large quantities to accommodate every size repair shop. Cassette spacers and lockrings for both Shimano and Campagnolo. Brake and cable parts including ferrules, cable crimps and cable donuts - all beautifully organized. Headset spacers including carbon fiber kits as well as black and silver aluminum spacers. "Wheels Mfg. has everything a bike shop needs for efficient repair work," says Karen Peterson of Lexco. "All of the small parts are organized and categorized so that repairs can be made as efficiently as possible which means less time on each repair and higher profits. Plus, Wheels Mfg. is a great technical resource." Says Daryl Nowak of Wheels Mfg. : "Wheels Mfg. is your domestic source for quality bicycle small parts and aftermarket accessories. With over 20 years of industry experience and knowledge, we have a number of solutions for today's bicycle mechanic. We stand 100 % behind our products and offer a 'no questions asked' guarantee on everything we sell. Wheels Mfg. is proud to work with Lexco to ensure bicycle mechanics everywhere have the tools and accessories they need to run a successful repair shop." For more information about Wheels Mfg. or to get the new Lexco 2010 product catalog, contact Lexco at (800) 626-6556, or e-mail sales@lexcobike.com. Lexco offers value-driven bicycle products and services to the marketplace. Lexco is a family-owned and operated business that began as a hardware store and Schwinn franchise on Chicago's west side in the 1950s. It continued as a Schwinn bicycle shop on the city's north side in the 60s, and in the 70s, Lexco began making bicycle security cables and has grown that into Lexco's cable division showcased at www.lexcocable.com. Lexco became a full-scale bicycle parts distributor in 1978. For more information, call toll-free (800) 626-6556 or visit www.lexcobike.com.